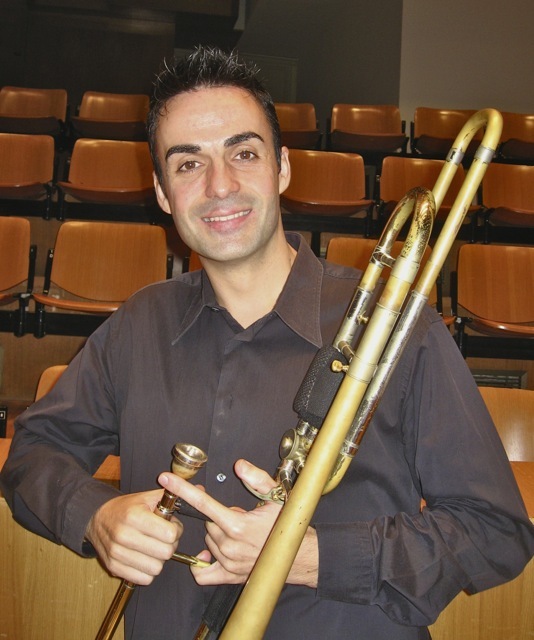 Juan Manuel REAL is principal trombone with the Orquesta de Valencia, and Professor at Musikene, in San Sebastián. He started his musical studies in Benaguasil (his home town) followed by Valencia, Amsterdam and London (BMus Guildhall School and graduate at the Royal Academy). His trombone teachers were, in chronological order: Rafael Tortajada, Rogelio Igualada and Ricardo Casero, in Spain; Michel Tilkin in Amsterdam and Eric Crees, Simon Wills, Peter Gane, John Kenny, Dudley Bright and Ian Bousfield, in London. He was a member of the JONDE (1997-99), Gustav Mahler Jugendorchester (1997-2001) and the Verbier Festival Youth Orchestra (2000 / 2001), where he had the opportunity to work with Claudio Abbado, Pierre Boulez, Seiji Ozawa, Mariss Jansons, Franz Welzer-Möst, James Levine, Zubin Mehta, Daniele Gatti or Kent Nagano, and played in major festivals such as Tanglewood (USA), London Proms, Edimburgh, Salzburg, Vienna and Lucerne. In 2003, and at the express request of Claudio Abbado, becomes part of the newly created Lucerne Festival Orchestra, where he had the privilege of working alongside musicians of great international prestige, both in chamber concerts as symphonic, which have been highly acclaimed recordings internationally. In 2006 was selected by Lorin Maazel as principal trombone for the Orquestra de la Comunitat Valenciana – Palau de les Arts, where he had the privilege of being part of such projects as Wagner`s Tetralogy, Trojans by Berlioz, Turandot, Carmen, Bohème and so on, conducted by Lorin Maazel, Zubin Mehta and Valery Gergiev, among others. He has collaborated with the Israel Philharmonic Orchestra, Bayerische Staatsoper (Munich), Rotterdam Philharmonic, Mahler Chamber Orchestra, Orchestra Mozart (Bologna), Orquestra de Cadaqués, as well as a large part of the Spanish orchestras and with diverse chamber groups: London Winds Ensemble, Lucerne Festival Brass, Taima Granada, MoonWinds, Trombons Arts Quartet, etc. Closely linked with the pedagogy of his instrument, Juan Manuel performs courses throughout our geography, highlighting his collaborations with youth orchestras: Orchestra of the Universitat de València, Jove Orquestra de la Generalitat Valenciana, Jove Orquestra Nacional de Catalunya (JONC), National Youth Orchestra of Spain (JONDE), Jeunesses Musicales World Orchestra (JMWO), among many others.